Courgette (Zucchini), Sautéed, Shallots, Tomatoes, Thyme for Cooking summer vegetables. 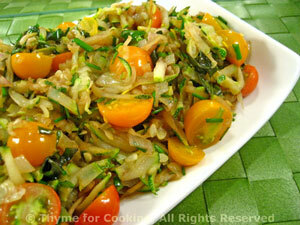 Stir-fried shredded zucchini or yellow squash, finished with a few cherry tomatoes - simple for summer. Add shallots and sauté until brown, about 7 minutes. Add courgette and stir-fry 2 - 3 minutes, just until softened. Add soy sauce, vinegar, herbs and tomatoes, stir-fry another 1 minute, to heat through and combine flavors. Remove and serve.